The first stage for all the Diaspora panels in the tapestry is trying to get the right stories, correctly told. Whilst nowadays much research can be accomplished online, there's still no better way than actually meeting diaspora Scots on the ground! We've already reported on first visits/ initiatives both in Corby and on Merseyside, but here's the latest update. In Corby the team was on the ground at The Grampian and The Cube for three days from 1st-3rd October, with excellent results - thanks in no small part to the story being reported by BBC Radio Northampton in its 8AM Breakfast Show. Two stitching groups came along to the Open Workshops. So too did historian John Lobb Douglas with his full analysis of the town's Highland Gatherings since 1968. Corby Council's Heritage Champion Cllr John McGhee also came along with his contributions. 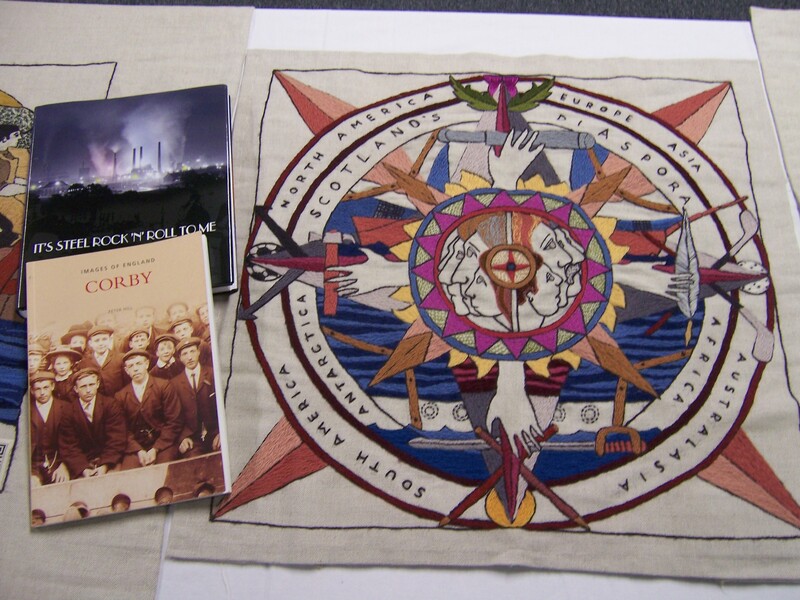 The next step in Corby is the Exhibition at The Grampian Club of the entire Battle of Prestonpans Tapestry from 25th-30th November with supporting music from the Grampian Pipe Band. During this week we'll be signing off the stories and then designing will commence so the local stitchers can begin sewing in Spring 2013. On Merseyside, the second location selected to represent the diaspora in England, additional possibilities have now emerged. In particular the Liverpool Scottish Regiment was very significant, as was the contribution to Medicine in the area. Dr James Currie came from Dumfries-shire in the 1780s and was followed by his nephew Dr William Duncan. These are added to the earlier list of Laird's Birkenhead shipyard, Glasgow's Alexander Elder and Dumfries' John Dempster with their shipping line, those who helped establish Tate & Lyle's refnery, Hugh MacDiarmid's sojurn, Police strike breaking and many clubs/ charities.